Intramuros is the most historical places in manila, the capital city of the Philippines. The walled city serves as the settlement of the Spaniards during their colonization of the country. The city boasts of a fort (Fort Santiago), churches, old Spanish houses, and antique guns that were mounted during the times when the Spaniards are the master of Manila. One can also find inside the museum that showcases the places where Jose Rizal was interred before he was executed. Intramuros is one of the top tourist spots in Manila and many people go there to relieve the history the history of Manila and the whole Philippines. The walled city is quite big and is tiresome to travel by foot. Would be visitors of the walled city need not to worry since there are many ways to tour Intramuros. This is the cheapest mode of travel inside Intramuros and the most tiresome. However, there many people who prefer to walk when they are traveling. If you are that kind of tourist, then that is not a problem since Intramuros are pedestrian friendly. When touring Intramuros by foot, it is advisable that you carry a map of the walled city so as to plan the best path that you could take for the tour. It is also advisable to bring an umbrella to avoid being scorched by the midday sun. Pedicab is a bicycle that has a covered sidecar. This is an ingenious way of moving inside Intramuros. Also, the pedicab drivers in Intramuros know the ins and outs of Intramuros like the palm of their hands. For tourists, these pedicab drivers already have their route that they follow to tour their clients. Most of them have pamphlets about the tourist spots inside the walled city. Pedicabs are hired for 100 pesos hour. You can go to interesting places for two hours while riding the pedicab. Kalesa is the Tagalog word for a horse-drawn carriage. 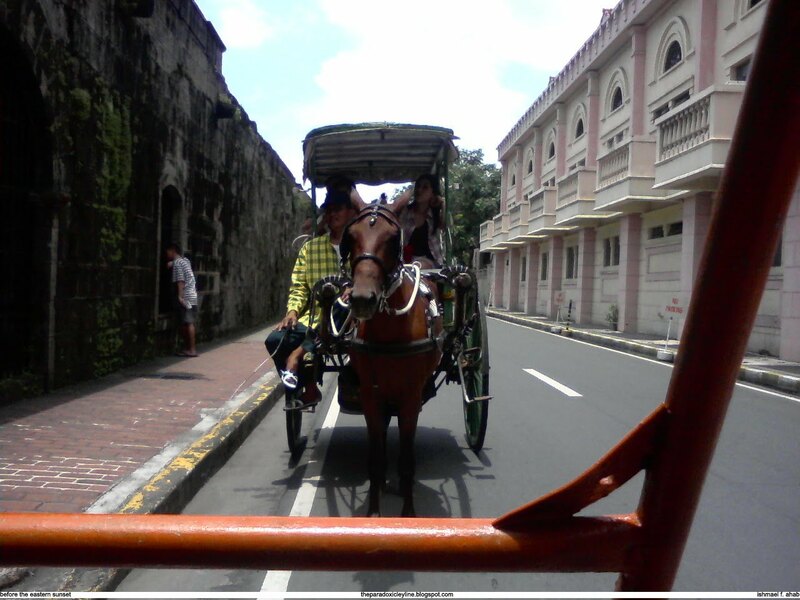 You can ride a kalesa to tour you around Intramuros. However, this is more expensive than hiring a pedicab. Riding a kalesa will give you a feeling that you are traveling Intramuros in the same way that the Spaniards had traveled in it during their days in the Philippines. 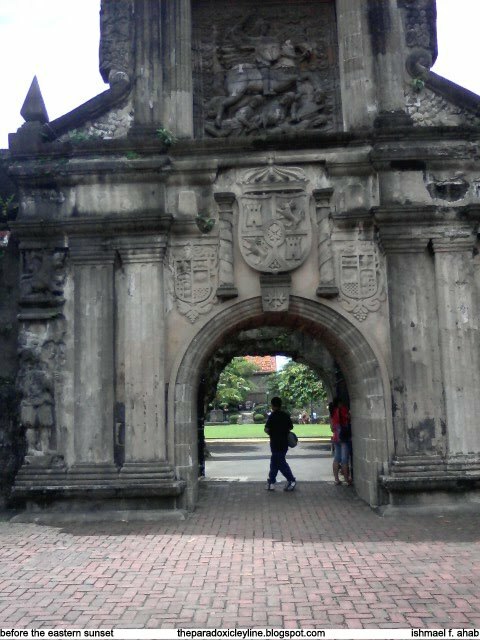 There are many tourist and travel agencies that offer touring services inside Intramuros. This is the most expensive of all mode of traveling inside the wall city. However, the benefits are that the tourist will get a professional tourist guides that know the history of every places in Intramuros. You will ride on horse drawn carriages that are better than the kalesas plying around the walled city. When going for a trip inside Intramuros, consider the options I have just given out and choose what is the best with regards to your budget and your time. The main goal is to enjoy visiting the place and choosing the best mode of traveling inside the walled city will help in achieving that. Visit my article about Intramuros in Before the Eastern Sunset. Also, in that blog, I have a new blog post which is about my visit to the Minor Basilica of the Santo Nino in Cebu City. 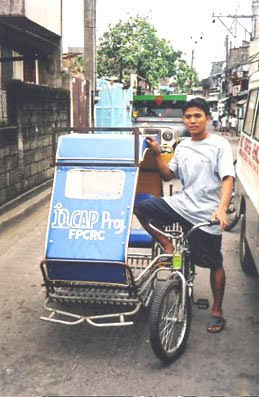 Photo of pedicab came from Kat's World 3.